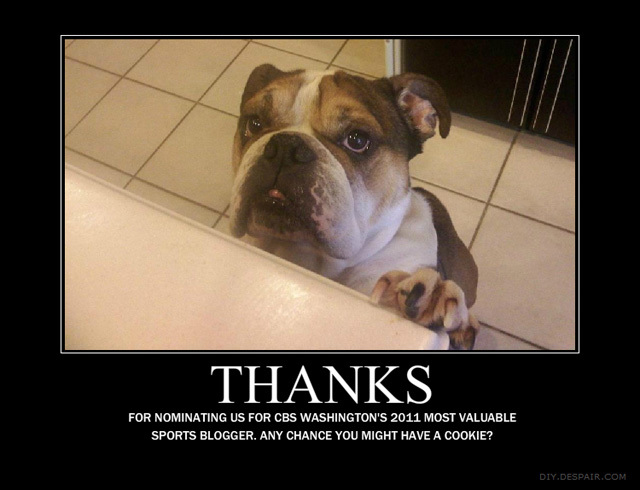 Looking over my Twitter feed, I’ve discovered that the site has been nominated for CBS Washington’s Most Valuable Blogger Awards 2011. So either my 87-year-old Mom has suddenly gotten tech-savvy, or somebody likes what we’re doing here. But competing against blogs for football, basketball, hockey, and the MMA, we have no chance of winning. But that’s okay — vote anyway and check out some of the other blogs in the area. And thanks for getting us noticed. Congrats! A well deserved nomination, as you continue to feed the beast that is the Nationals’ minor-league community with insightful commentary and give us room to vent as well. Congratulations Sue! This is a well deserved honor for someone very knowlegeable about baseball and our entire organization. This is definately MY favorite blog. Great job Sue! I agree with both; I think if you could get that photo put next to the site’s name on the ballot, it would be a landslide. The best type of blog/website — one where everyone contributes and all seamheads are created equal. I like the dog photos. One of the better part of reading this blog IMO. Pretty cute pup. peric: Don’t flatter Spike too much. As the site copy editor, it’ll go to his head & he’ll start making contract demands to Sue_D, leading to internal dissention & rifts within the staff – Next thing you know, anarchy! I love that little fella. He reminds me a lot of mine, actually. Congratulations. I agree with all of the above! !